Helping Pet Adoption < The Unexpected Pit Bull Calendar – A Gift That Gives Back! The Unexpected Pit Bull Calendar – A Gift That Gives Back! 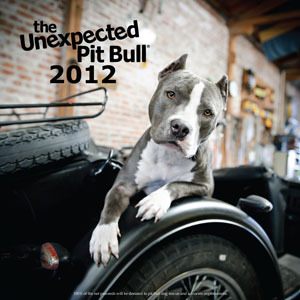 We are very excited about the new Unexpected Pit Bull 2012 Calendar! Since 2004 this professionally photographed calendar highlights the love and spirit of Pit Bulls. Created by The Unexpected Pit Bull, a not-for-profit organization that develops and markets merchandise celebrating Pit Bulls, 100% of the calendar’s net profits are donated to deserving Pit Bull charities (mostly rescue, education, and advocacy organizations) in need of support. And we find that pretty awesome! Since launching, The Unexpected Pit Bull’s signature product has been their annual calendar, which has even been featured on The Rachel Ray Show. The nonprofit’s goals are to keep Pit Bulls with the people who love them (and away from the ones who don’t), to fund specific advocacy and education initiatives for the breed, and to create beautiful calendars that communicate the delight of that comes with having a Pit Bull! We stand behind their mission and that is why this year, Adopt-a-Pet.com decided to support their calendar and their efforts to help more Pitties everywhere. If you love these dogs, want to help them overcome unfair stereotypes, and promote more appreciation for these beautiful animals, hanging The Unexpected Pit Bull calendar in your office might be a great way to help spread the message. This year the calendar was made in creation with HE(ART)S SPEAK – an organization that pairs photographers around the world with animals who need attention. Animal lovers and artists coming together – I mean, how cool is that?! The 2012 calendar edition features gorgeous photography and design, and we think they make terrific holiday gifts. There are a few promotions going on right now designed to make your holiday presents more affordable, which you can find out about by clicking here. This is truly a gift that gives back! And for anyone who’s ever enjoyed some Pittie kisses, you know how grateful these dogs are for your help.